Scottish Water employees are being asked to saddle up to raise money for the charity WaterAid in memory of their colleague, Bob Wilson. Bob, from Edinburgh, died suddenly in April 2016, aged 47. He was a keen cyclist so his friends, family and colleagues decided to organise a charity bike ride to raise money for his favourite charity WaterAid. WaterAid, which is Scottish Water’s charity of choice, is the UK’s specialist development charity working to help some of the poorest communities in Africa and Asia to help provide them with safe drinking water and better sanitation. Bob’s widow, Dr Dee Torrance, who has two children, Beccy, 21, and Angus, 16, initially planned to raise £900 using a JustGiving page, but the amount soared to £13,000 which is in the top 1% of JustGiving fund-raising in the world. They are doing the same this year and plan to cycle between all of Scottish Water’s offices from Inverness to Edinburgh. There are 17 races of varying distances which total 630 miles taking place between August 18 and 26 all over Scotland. The first day will see staff take on the route from Inverness down to Elgin. On Saturday the relay will head down the coast on the road to Aberdeen through Turriff and Oldmeldrum. Sunday sees cyclists make the trip down the A90 to Stonehaven. 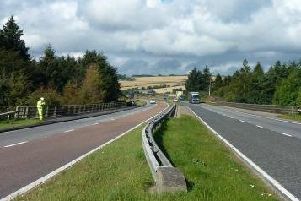 There are various other stages along the route through Aberdeenshire, Angus, Perth and Kinross and Fife during the week, with the relay due to finish a week on Saturday in Edinburgh. Dee said: “WaterAid was close to Bob’s heart so when he died suddenly and we were trying to make sense of our loss, it seemed fitting to raise money for WaterAid. The money raised last year was used to fund WaterAid’s sanitation champions in Zambia. The champions are taught about water sanitation and then pass on their knowledge to other people in their village. The work has changed the lives of many and has lessened the occurrence of illnesses resulting from poor sanitation. One such champion, Grace Chitungu campaigned for the construction of toilets in her village and as a result of her hard work every household has a toilet. One of Scottish Water’s directors, Rob Mustard said: “This is a great event for friends, family and colleagues of Bob to support WaterAid while, at the same time, taking the time to celebrate and remember Bob in a way that I know he would be really positive and proud about”.